Never afraid to explore uncharted waters, MB Quart continues its tradition of designing and manufacturing innovative and technically advanced equipment with its audio/video processing center (APC) for the marine industry. 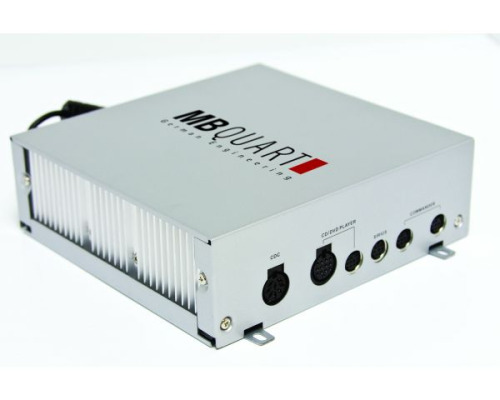 The MB Quart APC comes aboard with its sea legs firmly planted, featuring full * and satellite radio integration, as well as USB flash drive capabilities. Don't be marooned with the landlubbers. Surrender to the seven seas with the flexibility and convenience of an audio/video entertainment system that can be as simple or robust as one's heart desires. 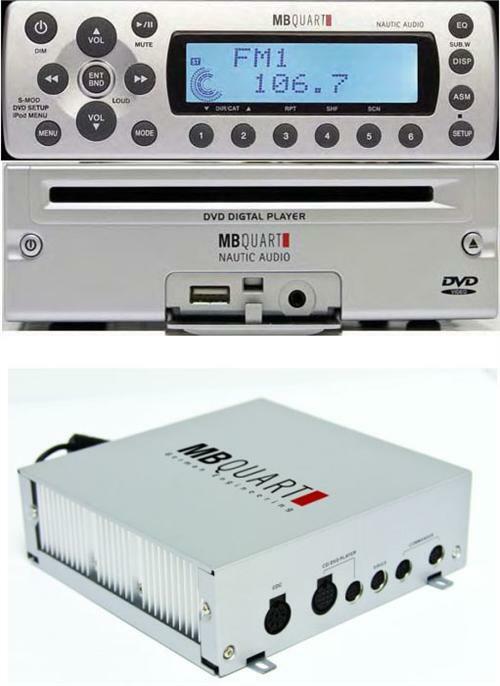 WM1-BB Features: AM/FM tuner with 12 AM/18 FM presets, 50 watts x 4, 3 RCA pre-outs including subwoofer level and crossover, AUX line input, compatible with MB Quart LCD hardwired radio controllers and Infrared remotes, controls optional MB Quart WBB-CD and WBB-DVD slave players, integrates SIRIUS Satellite radio tuner, accepts MB Quart I-connect cable allowing complete control and viewing of digital displays on receiver and controller faceplate, includes USB input supporting up to 2Gb of MP3 or WMA, power-down memory to retain presets and zero current draw design. 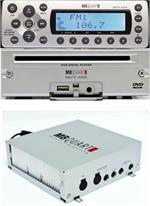 Plays DVD/DVD-R-RW, CD, CD-R/RW, MP3 and WMA formats. Multiregional DVD capable. Large, easy-to-read backlit LCD and 2-line dot matrix display design, remotely controls radio and iPod, full radio control including radio presets and audio settings, waterproof IPX7 construction, salt/UV resistance. Recommended for use with WM1-BB, but compatible with all MB Quart marine radios.